Ghosts of Sackett Lake by Phil Sills, a Mysterious Review. 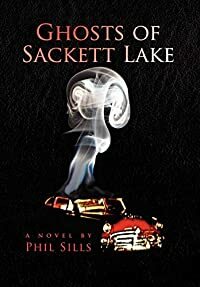 Review: Max Rosen, a 60-year-old man, decides to rediscover his past and takes a trip to the site of one of his first jobs and finds a dead body in the trunk of an abandoned car in Ghosts of Sackett Lake, an uneven, but often chilling thriller by Phil Sills. Max doesn't remember much about his college-age days and thinks it would be a good bonding experience with his twin 12-year-old sons to take a men-only trip from their home in Boston to Sackett Lake in upstate New York. Max had a job at a hotel there when he was younger and he thinks that by revisiting the area he may remember more about his life at that time. They find the hotel site razed, largely overgrown with vegetation. An abandoned car attracts the twins' attention, a rusted out Hudson Hornet sedan. Seeing some vines extending from the trunk, they pull on them and are shocked to find a human hand attached. Max calls the police and when they arrive to investigate, they immediately suspect Max of some knowledge of the victim, a young woman. He's released from custody but spends the next few days following his own leads to determine the identity of the dead girl all the while pursued by the police who remain convinced he's connected in some way to her death. The story in Ghosts of Sackett Lake is interesting and, for the most part, well told. It's sufficiently eerie in the sense that the reader doesn't quite know how Max's situation will be resolved or what may have happened so many years ago that led to his discovery of a dead body in the trunk of a car that he clearly seems familiar with, though publicly denies knowing. But the narrative lacks atmosphere, that hard-to-define but easy-to-recognize aspect of a suspense story that gives it richness and depth. On a technical level, Ghosts of Sackett Lake is marred by some significant and persistent syntax and punctuation problems that could have readily been corrected with a critical eye to editing. It seems a shame that self-published authors make the effort to create a story and develop characters but then not follow through and polish the material to make it shine prior to publication. Acknowledgment: Phil Sills provided a trade paperback edition of Ghosts of Sackett Lake for this review.